If you're working on a client side project that includes an NPM folder with a large number of dependencies and you're using a WebSite Project in Visual Studio, you've probably found that this is a terrible combination out of the box. It results in very slow load times and/or file load errors. WebSite Projects (WSP) are a pure file representation on disk, so they show you all files, including the crazy large number of files in the node_modules folder which isn't excluded by default. The problem is that WSPs don't have a project file. There's no file mapping, which is one of the primary reasons why it seems like a good idea for client side projects in the first place; nobody wants to maintain and add files manually to a project when managing files externally. The downside is that you have no control over what gets pulled into the project. There is absolutely no configuration in Web site projects. This affects both the files you see in the 'project' as well as for publishing, although for publishing there is at least some control via a *.pubxml file where you can exclude files and folders from publishing. Unfortunately that's not true for the file content of the 'project'. In short if you have a massive node_modules folder that folder shows in the project. There's no official, built-in way to limit files or folders - which seems rather silly given that this is such a common use case and we're easily 5 years in from when NPM became a common Web development 'thing'. For most ASP.NET applications I use Web Applications which are functionally opposite - you have all the control over files in a project so much so that you have to explicitly add every single one. For applications that include .NET code Applications that makes good sense. As it does when you actually work entirely in Visual Studio for your client side project where you manage all files through the IDE. But Web Applications fall apart when files are not added and maintained through Visual Studio. I use WebSite Projects only for static content sites (main site, product sites), or as is the case now when working for a client who insists that the project I'm working on with other tools shows up in Visual Studio and uses the same source control access. I'm working work on an Angular 2 project, and although I don't actually edit the Web code in Visual Studio - I'm using WebStorm - due to requirements and the TFS source control in use, the Web site needs to be part of the larger Visual Studio Solution. The Web site is pure client side code, with the API and service projects that the Angular app calls living in completely separate projects. Since I'm modifying files external to Visual Studio a WebSite Project seems like the only reasonable choice. When I created the WebSite Project and added it into the larger Visual Studio solution, I found out quickly how terrible the support for client projects is in that configuration. Initial load of the project took about 5 minutes while Visual Studio white screened and only eventually returned. When it came back I got a ton of TFS errors for $. files - about 100 of them that I had to CR through. It's quite remarkable that Microsoft hasn't addressed such a common scenario. Eventually I end up with the node_modules folder in the project. But - refreshing the folder, or re-opening the solution goes right back to the slow load time and then those very same errors. Seriously??? The solution to provide a reasonable experience is to mark the node_modules folder as a hidden folder. This effectively hides the folder from Visual Studio and it ignores it in the Solution Explorer. You can set the hidden attribute on the folder only - no need to set it on all the child items. NPM continues to work with the hidden folder, so there appears to be no ill effect for actual package access. to ensure that source control also ignores the folder - it doesn't seem to mind the hidden folder and otherwise would still try to add it. 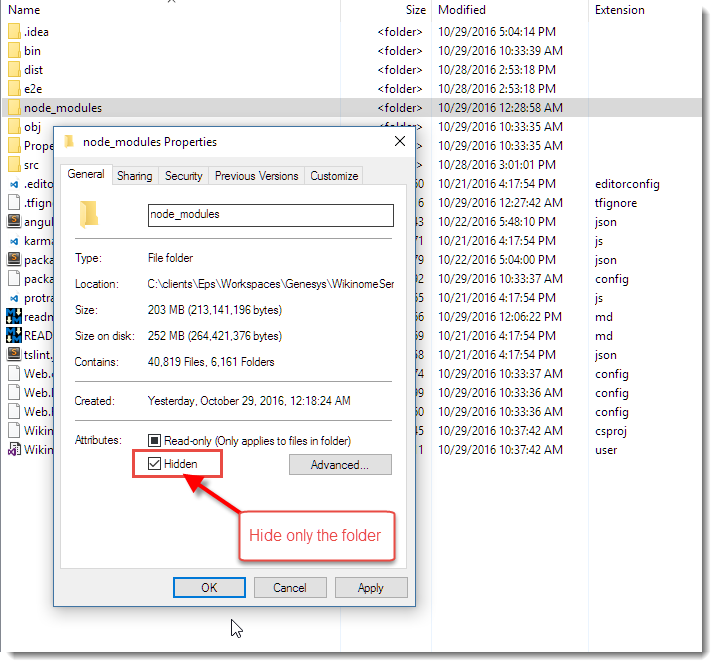 Hiding the folder also prevents Web Deploy from publishing the files. 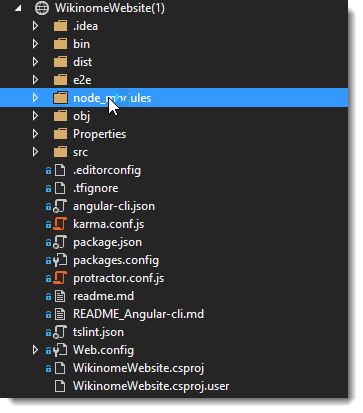 So, if you must use WebSite Projects, hiding the node_modules folder is the way to go. I can't take credit for this - I found this as part of a few StackOverFlow posts - but the solution is not clearly identified or searchable, so hopefully this post will make that a little easier to find. The next version of Visual Studio - version 15 apparently will introduce a new Web project model that's supposed to be a hybrid between Web Applications and WebSite projects. There is a project file, but files by default add without explicit adding using an exclusion template. This seems like a pretty obvious solution - shame it took well over 10 years for Visual Studio to figure that one out especially since just about any other Web development tool operates that way. I haven't played with Visual Studio 15 yet, but I really hope this will be a workable scenario going forward. Visual Studio really needs to have an easier way to deal with free form file based sites. .Net core and VS 2015 has a similar problem. @Charlie - In .NET Core projects node_modules is excluded by default and doesn't show in the solution explorer, so this isn't a problem. This is workable and realistically I have no problems with Core projects. The problem is that I can't use a Core project with older applications at the moment. I'm hoping that whatever new project type comes along in Visual Studio 15 will be for ALL versions of .NET, not just for .NET Core/ASP.NET Core. I have a feeling it's just going to be for the Core versions. Very informative post. Having read your post I decided to develop Web Application for my official website http://essaydune.com/blog/. I find Web Application to be a very convenient way for client to reach my services through smartphone applications any time and any place they want. I will be waiting for the newest version of Visual Studio 2017 tool. Nice job finding that man! LOL! Yeah, I ran into this with VS2015, very annoying. I just excluded node_modules and things seem to be working fine for the most part, but when I do a restore packages lately it started slowing down and is not always updating everything to the latest available. 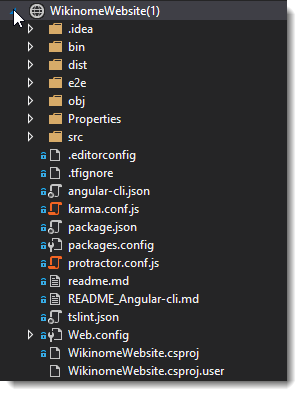 Very frustrating working with Angular v4 and having a VS2015 project like this. Great tip. I noticed how long this was taking and I was like, "I am not even using node!" It did not even show up in VS though in 2017 it just happens on the upload, real annoying. Thanks for the tip! Although the trick of hiding the folder didn't work for me in VS 2017, you explained the nature of the problem perfectly, and that's half the battle. Thanks!